The Women's Boat to Gaza - part of the Freedom Flotilla Coalition that hopes to sail to Gaza this September or October with food, medicine, and humanitarian aid has been endorsed by CCPJ. Good on us. Stay tuned for ways we can help. "America's defense budget is now larger in inflation-adjusted dollars than at any point since the end of World War II, and yet our Army has fewer combat brigades than at any point in that period; our Navy has fewer combat ships; and the Air Force has fewer combat aircraft. Our major equipment inventories for these major forces are older on average than any point since 1946 - or in some cases, in our entire history." - Winslow Wheeler, defense budget authority who worked for 31 years for Republican members of the Senate and for the General Accounting Office on military expenditures, on our trillion dollar defense budget, more than all other national defense budgets combined. 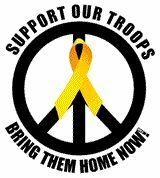 Iraq War: 4,000 US Dead as Year Six Began - for what? 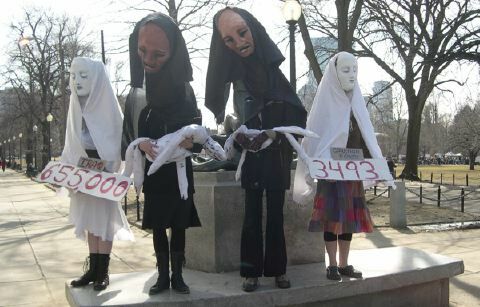 'Coalition of the willing' is 97% U.S.
5/19/07: Mass. Democratic Convention overwhelmingly passed resolutions for congressional delegation to impeach Bush/Cheney and to bring the troops home now. Watch this Video Before You Enlist! Reading names of the war dead at Delahunt's office on March 19, 2005. 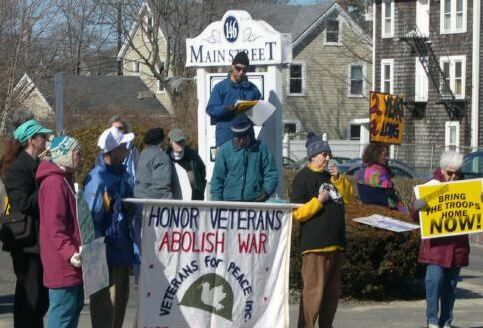 Protest the war each Friday in Hyannis. "Be studious, stay in school and stay away from the military. I mean it." Marine Staff Sgt. Russell Slay, giving instructions to his 5-year-old son, Walker, in a letter to his family shortly before he was killed. He was one of 12 soldiers from Texas killed in Iraq during the month of November, 2004. Apr2:General William Odom Tells Senate: "Rapid Withdrawal Is Only Solution"
Aug31: Lawmakers "Slimed in the Green Zone"
Jul16: Cunningham report - who's complicit? Jun26: US Conference of Mayors: Out of Iraq! Dec26: Afghan heroin's surge poses danger in U.S.
Nov9: "Pelosi Must Ponder Impeachment"
Oct10: Iraqi War Dead Now Over 650,000? July18: Democracy in Crisis - Interview with RFK, Jr.
Jun6: Was the 2004 Election Stolen? May20: Gen. Hayden: Confirm or Court-Martial? May16: They Track Journalists, Don't They? Dec22: Scott Ritter: "This is a war that's not worth the life of one American"
Dec10: Cunningham / GOP scam funneled multi-millions of tax $ to GOP campaigns over 7 years! Nov30: Over 210 private jets carrying detainees (for CIA torture) have stopped over in the UK in addition to Finland, Hungary, Iceland, Italy, Norway, Poland, Portugal, Romania, Spain and Sweden. Nov29: Neocon sense of responsibility - Rumsfeld thinks we have none. Nov7,2: Author Scooter Libby, 1st white house official indicted in 130 years: war criminal AND pervert. Ask Bush to explain "fixing the intelligence and facts around the policy" to justify the invasion of Iraq. Photo by signing John Conyers' letter. 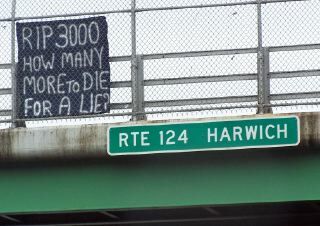 Join 500,000 citizens and 121 congressmen who want answers about proof of Bush's lies to Congress and the nation at least 8 months before unleashing the bombs on the civilian population center of Baghdad. Is the Wartime President a Military Deserter?